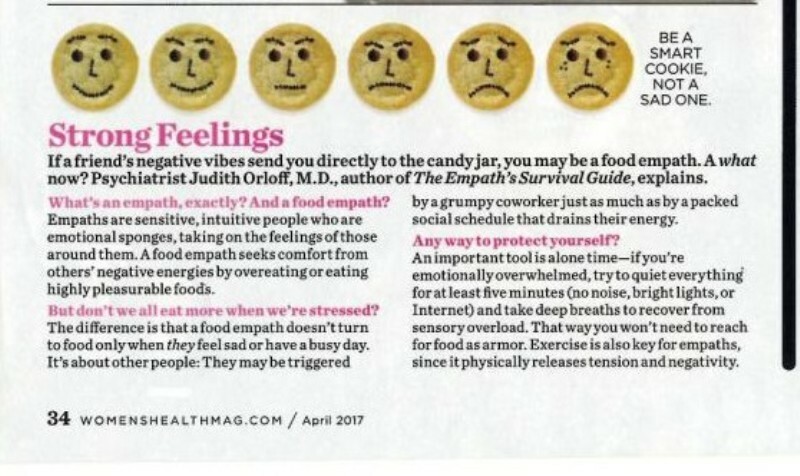 Women’s Health Magazine: What is a Food Empath? Food addiction and overeating are common among empaths. Empaths are highly sensitive people who absorb the stresses and emotions of others into their bodies. When food empaths absorb the stresses of the world, they may feel the unconscious need to armor themselves by overeating. If you overeat or binge on sugar, carbs, or junk food when you’re emotionally overwhelmed–or if you’re sensitive to the effects of foods in your body–you may be a food empath. In this Women’s Health article, I share what it means to be a food empath and ways to ground yourself without turning to food addictions. More information about food empaths can be found in my book The Empath’s Survival Guide: Life Strategies for Sensitive People.